^ 2005–06 UEFA Champions League group stage: Group C. UEFA. [2008年8月21日]. ^ 2005–06 UEFA Champions League group stage: Group B. UEFA. [2007年8月21日]. 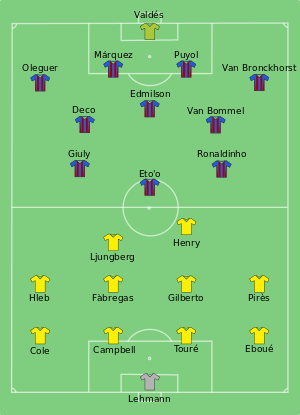 ^ UEFA Champions League: Season 2005−06: First knockout round. UEFA. [2008年8月21日]. ^ UEFA Champions League: Season 2005-06: Quarter-finals. UEFA. [2008年8月21日]. ^ UEFA Champions League: Season 2005-06: Semi-finals. UEFA. [2008年8月21日]. ^ Full time report (PDF). UEFA. 2006年5月17日 [2006年11月26日]. ^ Line-ups (PDF). UEFA. 2006年5月17日 [2006年11月26日]. ^ Half time Report (PDF). UEFA. 2006年5月17日 [2008年11月27日]. ^ Statistics. UEFA. 2006年5月17日 [2008年11月27日].